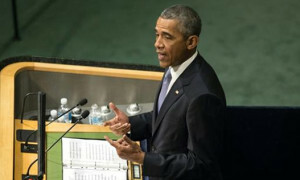 The U.S. president said in his speech at the UN General Assembly that his country is prepared to discuss solutions to the conflict in Syria with Iran and Russia. AFP reported on Monday September 28 that Barack Obama insisted, however, that it was not possible to return to the status quo under President Beshar Assad. “The United States is prepared to work with any nation, including Russia and Iran, to resolve the conflict, but we must recognize that there cannot be, after so much bloodshed, so much carnage, a return to the pre-war status quo,” Obama said in his UN address. Obama was reportedly to meet with the Russian President today on the sidelines of the UN assembly in order to discuss the Syrian conflict. Iran and Russia have announced, however, that their objective in Syria is to fight against ISIS and not to oust the Assad regime. Russian President Vladimir Putin and Iranian President Hassan Rohani were also scheduled to make a speech at the UN General Assembly today. Obama also used the opportunity to reiterate his support for the nuclear agreement achieved between Iran and the 5+1.